I recently was invited to appear on an episode of the Paracast, “a special shop talk/listener roundtable episode...” Somehow, much of the discussion centered on the cover-up of alien bases on the dark side of the Moon, so I didn’t have much to add to the conversation. However, there were some listener’s questions that were very good, but there wasn’t time to present them all. A few very good ones came from “cosmonaut,” who'd asked about the Cash Landrum UFO case. If it was a human military experiment why test the craft in a public area? How do you explain that? The idea that a secret or experimental craft would be tested over a populated area seems incredible, as in the ridiculously implausible sense of the word. 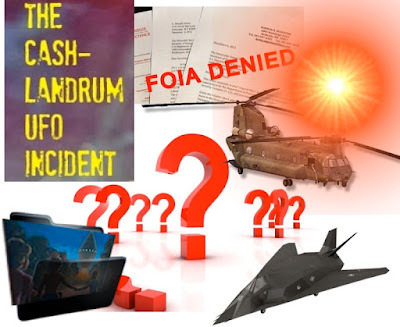 The article “Cracks in the Black Dike” by Jim Cunningham is an excellent examination of the attempt and failure to maintain secrecy about the F-117A stealth plane. 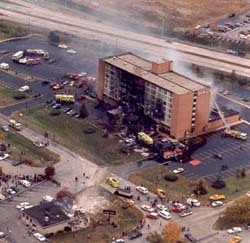 In it, he mentions two crashes from the program that were near populated areas, the July 1986 crash of a training flight near Bakersfield, California, and also an A-7D Corsair (a daytime stand-in for used to keep F-117A pilots sharp) crashed into a hotel in Indianapolis, Indiana, killing 10 people. Also, there have been a number of accidents in populated areas involving classified transportation of nuclear materials or weapons, as you'll see in this article on U.S. Nuclear Accidents. There must be many more projects that we’ll never know about, and it’s only because these incidents were disastrous and unsuccessful that become public knowledge. These examples can’t prove anything about the UFO in the Cash-Landrum story, but they show that the potentially dangerous military operations have often been conducted close to populated areas. One further comment on the UFO as a secret military project. I think it is unlikely. These projects are built to solve a particular problem or serve a pressing need. 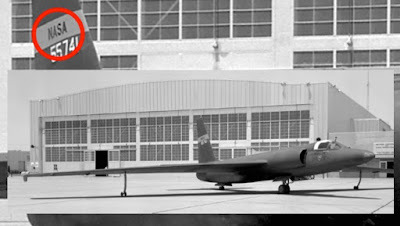 US spy planes are a perfect example of that, and provide a good case to study in the developmental process. What we usually see is a five to ten year developmental period involving dozens or hundreds of people. Typically, secrecy of the project or its concept is not tightly maintained, about all that can be concealed is its purpose or function and some of the technical and operational details. For example, the CIA’s U-2 spy plane was claimed to be a NASA project collecting weather data at high altitude. NASA's experimental weather plane, so the cover story said. What attempts have been made to get FOIA documents and the results? As far as I know, these are the only materials produced and have been released to multiple individuals over the years. so far, I’ve only attempted two FOIA requests, one directed at getting the records from Bergstrom AFB, and another directed at the DAIG. both were unsuccessful. There must be other material, but locating it and getting it released may be difficult. There should be documents from the Air Force from Captain Virginia (Ginny) Lampley’s brief investigation, from the defense prepared by Assistant U.S. Attorney Frank Conforti in the legal case, and from the various branches of the military and NASA when they prepared statements indicating that they neither owned or operated any device resembling the UFO. In addition to that, there may be court documents from the Southern District Federal Court in Houston. Probably no smoking guns in there, but material I’d like to obtain and have persevered for the study of the case. These are the known knowns and known unknowns, but there may be unknown unknowns as well. Can you elaborate on the idea that the UFO was launched from an aircraft carrier? What is the source and evidence for that? The aircraft carrier theory was proposed by John Schuessler, but as a source for the helicopters, not the UFO. He suggested it could have been the USS New Orleans. Tim Printy looked into these claims, and found it unlikely, with the New Orleans in particular being ruled out. Additionally, such a carrier would provide only about half the number of helicopters described in the case, and we’d still have to find a source for the others. Schuessler has done just the type of thing that skeptics get hammered for, manufacturing a real-world solution that fits the story, but for which there is no evidence. What is your plan to further investigate this spectacular case? 1) Seek out unreleased civilian documents on the case. There seem to be some in the files of both MUFON and FUFOR. The key item here is the original report made by Project VISIT led by John F. Schuessler. Copies of this report were circulated to the prominent UFO organizations at the time, but for whatever reason are not available. 2) Launch targeted FOIA requests for the material described above. 3) There are surviving participants in the case, reporters, investigators, medical and perhaps military personnel. Some of these have not spoken publicly in the case since after the story initially broke. I’ve located some of these individuals and would like to travel to Texas to personally interview them. There are some other items, probably held by the family of the witnesses. For example, Betty Cash had a big file of clippings correspondence and documents, and Vickie Landrum maintained a log of her and Colby’s health and experience after the event. These personal records are a sensitive issue, so that will depend on the cooperation of the families. Cosmonaut, thank you for asking some very good questions about the case. The C-L story is fascinating and holds a unique place in UFO history. The response and interaction by the US government alone sets it apart from other cases and makes it worthy of study. While the case has become a legend, underneath the layers of myth, there seems to some genuine event at the core. I also hope that by continuing to discuss the case that perhaps someone with information about it will be prompted to come forward to share it.